Is there an appropriate noun for a collection of Winston Churchill performances? A growl of Churchills perhaps? Gary Oldman's stirring tour de force comes at the end of a very long line of recent contenders, from Brian Cox to John Lithgow and Michael Gambon. Oldman easily outshines them all, attacking the part with the relish of a performer faced with a three-course banquet after a diet of bread and water. The actor is virtually unrecognisable in Darkest Hour, his features hidden beneath a stunningly effective make-up job. Jowly, bald and portly, he matches all the familiar physical characteristics of Churchill with an expert approximation of his vocal mannerisms from an alcohol-slurred splutter to the spellbinding rhetoric that inspired a nation at war. Oldman is the finest aspect of a film that risks seeming very familiar in the wake of 2017 releases Churchill and Dunkirk. It is set in May 1940 as Prime Minister Neville Chamberlain (Ronald Pickup) has lost the confidence of the nation and is set to resign. The situation in Europe worsens by the day and there is a growing possibility that Britain may be forced to seek a peace settlement with Hitler. Cometh the hour, cometh the man, as Churchill is appointed PM. 'Here's to not buggering it up,' is the family toast. 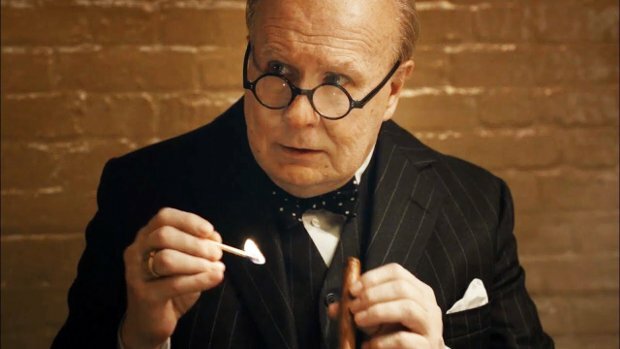 Covering familiar political backstabbing, the reservations of the King (Ben Mendelsohn), the rock solid support of Churchill's beloved Clemmie (an excellent Kristin Scott Thomas) and the evacuation of British troops from France, Darkest Hour is a lively jig through the pages of history that's not immune to overdoing its hero worship of the central character. A morale-boosting jaunt on the London Underground to meet the common folks does seem a step too far in a largely confidently handled crowdpleaser from director Joe Wright. Screening as part of the Toronto International Film Festival 2017. General release from Fri 12 Jan.